If you're considering a bathtub reglazing, consider Perma-Glaze. It's a handy new synthetic porcelain that can refinish your worn-out bathroom and kitchen surfaces or appliances in less than a day. Simply apply Perma-Glaze to your cracked or unsightly bathtub and be amazed at the results. Before you begin a costly renovation project, consider the possibilities. It can take weeks to replace your bathtub, as well as cost a fortune. Why spend all that money and time when you could just fix up the one you've got, good-as-new? Perma-Glaze combines ultra-durable materials with rich and powerful color to create a replacement finish that looks brand new. Your new Perma-Glaze finish will act just like the old surface, and can be regularly sanitized and cleaned. All the while, it remains durable and stain-resistant. Visit our website to see amazing before and after photos of bathrooms and kitchens that have been refinished with Perma-Glaze. You won't believe your eyes. The time and effort this quick process can save you will make you a believer. 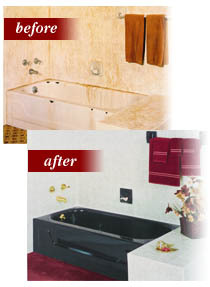 For an affordable and amazing bathtub reglazing, the Perma-Glaze center is available to help. Contact us or visit our website for further information and if you have any questions.